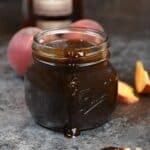 This thick and tangy Peach Bourbon Barbecue Sauce gets it's sweetness from ripe peaches, it's tang from bourbon, and a bit of heat from chili powder to create an amazing absolutely sauce! Heat oil in a medium sauce pan over medium heat. Add the onion and cook until softened and golden brown. Add the garlic and cook until fragrant, about one minute. Stir in the chili powder and cook for an additional minute or two. Stir in the ketchup, molasses, brown sugar, vinegar, and Worcestershire sauce. Return to heat and stir until thoroughly combined. Pour in the peaches and stir to combine. Bring to a boil, then reduce heat to LOW and simmer for 20 minutes until thickened. Remove from heat and puree with an immersion blender to break up the peaches and onions. Allow sauce to cool before pouring into a glass jar or storage container. Store in the refrigerator for up to 3 weeks, assuming it lasts that long! For a spicier sauce, add additional chili powder. I use natural ketchup that does not contain high-fructose corn syrup. For a perfectly smooth sauce, carefully pour into a blender and puree until smooth. Check the sauce for sweetness and spiciness before you blend. Not all peaches are sweet, and everyone has a different spice tolerance.